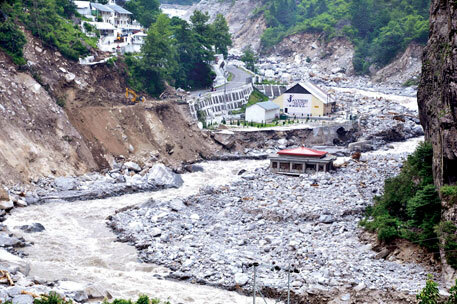 It seems policymakers have failed to learn from the floods that hit Uttarakhand in June 2013. At a time when environmentalists are talking about how unplanned development and deforestation in the fragile Himalayan state made the disaster ferocious, a high-level committee set up by the prime minister has recommended relaxing forest diversion rules for development projects in all the five Himalayan states and adjoining states in the Northeast. These forest-rich hilly states, known for poor infrastructure, have long been demanding such relaxation saying that existing forest diversion rules hinder development. They have also been asking for financial compensation for preserving forests, and thereby the health of biodiversity, at the cost of infrastructure development. To look into these concerns, Prime Minister Manmohan Singh in November 2011 constituted a 10-member committee under Planning Commission member B K Chaturvedi. Its report, made public in February this year, recommends that projects requiring up to 10 hectares (ha) of forest land need not seek clearance from the Union Ministry of Environment and Forests (MoEF). At present, development and public utility projects require MoEF clearance for felling forests beyond 1 ha and 5 ha, respectively. The committee also allows Border Road Organisation to lay wide roads—widen existing roads from the current 24 metres to 60 metres and build new roads of 100 metres width. “Thousands of small projects are being delayed because of forest land diversion rules,” says Yogesh Suri, adviser to the Planning Commission on development policy, who was part of the committee. “We increased the area on the basis of feedback received from various sectors.” To ensure speedy and transparent clearance, the committee has recommended setting up MoEF offices in each state. “The current process of seeking environment and forest clearances is centralised. Since hilly states have rich forest cover, they require clearance even for a small project. This causes inordinate delay,” says another Planning Commission official. To ensure time-bound clearance, the committee has recommended amending forest clearance rules for hilly states in line with those applicable in Naxal-affected areas. MoEF clears all projects in Naxal-affected areas, which are among the poorest in the country, in three to six months. Money to keep or fell forests? Acceding to a long-standing demand of hilly states, the committee recommends compensation—2 per cent of the budget set aside for Central schemes—for maintaining high forest cover. This works out to be Rs 10,000 crore in 2013-14 alone. By contrast, the 12th and 13th finance commissions paid Rs 1,000 crore and Rs 5,000 crore respectively to Uttarakhand, Himachal Pradesh and Jammu and Kashmir for standing forests. Justifying the compensation, a committee member says, “These states fail to use forest resources to generate revenue and at the same time incur significant expenditure for maintaining the vast swathe of forest.” Due to lack of barren land, they also fail to use the funds under Compensatory Afforestation Fund Management and Planning Authority (CAMPA)—cost paid by the project proponent for diversion of forest land. According to the report, forest cover in the 11 hilly states increased from 31.8 per cent in 1991 to 34 per cent in 2011. The national forest cover increased from 19.49 per cent to 21.05 per cent during the period. The committee has devised two mechanisms, called development disability indices (DDI), for allocating the compensation. “Instead of social indicators, these indices are based on factors that hinder development and cause economic loss,” informs an official. He explains the reason behind the mechanism: Himalayan states fare better on social indicators such as per capita income, infant mortality rate and access to safe drinking water. But difficult terrain and inadequate infrastructure, especially connectivity, increases the cost of service delivery. 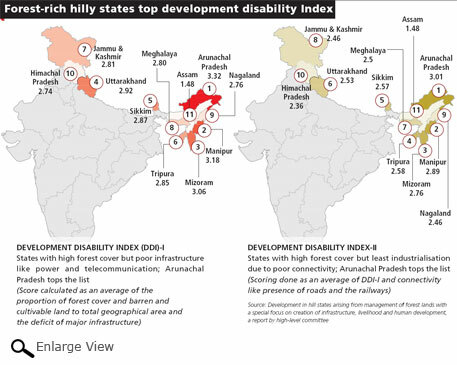 All the 11 hilly states top the DDI, indicating their disadvantageous condition (see ‘Forest-rich hilly states...’). The compensation will, however, be linked to development projects. “It is like a carrot and stick policy. The performing states would benefit more,” says the official. This means states will be rewarded for diverting forests for non-forest uses. “It is a way of licensing to destroy the fragile forest area,” says Bharat Jhunjhunwala, environment activist in Uttarakhand. “The report talks about development but is silent on environmental parameters. It proposes small benefit at a high cost of biodiversity.” Guman Singh of non-profit Himalaya Niti Abhiyan says, the recommendations will change the landscape by expediting projects at a faster pace. Anil Joshi, environment activist in Uttarakhand, says, the recommendations will speed up setting up infrastructures. But at the same time, it will open up opportunities for greedy businessmen to collude with corrupt officials and divert large swathes of forests in their own interest, he adds. The scars of Belakuchi (1970), Tawaghat (1977), BHagirathi in Uttarkashi (1978), Tawaghat (1979), Gyansu (1980), Uttarkashi (2010) are still there and wounds of Kedarnath (2013) are yet to heal. Yet the planners decide to allow 10 ha of forests to be hacked without taking clearance to expedite development. I suggest, all those who permit such relaxations should be gifted a plot of suitable size in such areas where forests have been hacked for 'development' and compelled to live there under the shadow of landslides. At least their successors would think twice before permitting such blatant hacking of forests. Yes I agree that the hilly states do need to develop-but at what cost? If the land of the hill slopes slips away for want of anchor of trees, the development may be an exercise in futility. Cutting of trees at spot X may be permitted, if the industrialist/developer plants twice the number of trees on denuded slopes elsewhere. Does this Government want to create more and more graveyards in the hills, even after the experience of the Kedarnath havoc ? Do the committee members have experience of facing the landslides due to clearance of the forests on Himalayas ? They should be made to live there under the sky where the forests are cleared and face the landslides occurring every now and then in Himalayas. Then they will think of the agony of the people living on hills.